I love my vintage craft books. These adorable snails came from a Sunset Kid's Crafts book from 1973. Aren't they cute? I made some out of scrap paper. The edges from the bat labels I printed the other day on the pretty coffee paper, and one out of a bag from the bead show I was at last Saturday. 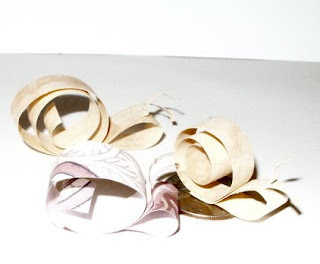 Curling paper is easy, it's similar to curling ribbons but going too fast can tear the paper. 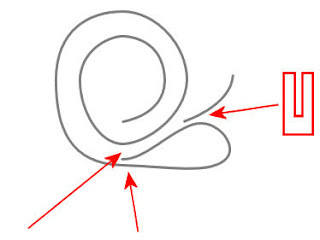 I'll usually use a table edge or my fingernail instead of scissors and hold it down and pull like you do for curling ribbon. I used a glue stick for these. 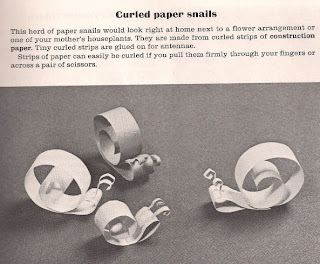 Cut the strip of paper for the snail. I made my strips between 6 and 8 inches long and about a half inch wide, curl the paper, then curve in the head and glue it, and glue the bottom of the "shell" spiral on top of the part of the head you glued down. Cut out a small antenna shape and fold the base of it up at a 90 degree angle and curl the antenna using your thumbnail and index finger. Glue in place on the head. Great way to use security envelopes and other scrap paper. I think they are entirely too cute. I posted an article on doing the loops on eye pins you can find here. I used to make these out of the bread crusts for my preschoolers. I used peanut butter for the "glue". I love snails! Thanks for this craft. I've become vary attached with snails. We found a snail in the package of celery, and have been taking care (it's shell was cracked) of it. He's been doing well, and growing!